1. Disney cruise Vacations quite simply take all the wonder and amazement out of their famous parks and put them afloat on beautiful ships. On the Disney Magic, starting at just $1,421pp., and lasting for 7 nights, you can travel roundtrip from Barcelona and visit such ports as Nice, La Spezia, Rome and Naples. This cruise departs on August 10, 2013. 2. Another Disney cruise to Europe is also aboard the Disney Magic, where for 4 nights starting July 9, 2013 roundtrip from Barcelona you can take in the sights at Villefranche-sur-mar and Palma de Mallorca, all from just $840pp. 3. The deals continue with Alaska cruise deals like the one offered from August 12, 2013, where for 7 nights on the Disney Wonder you can see the Tracy Arm Fjord, and stop in Skagway, Juneau and Ketchikan, all with your favorite Disney characters by you side. This sailing has prices starting from $1,225pp. 4. Disney cruise deals to the Bahamas are roundtrip from Port Canaveral, making it easy to incorporate the theme parks into your vacation as well. The 3-night sailing on January 17, 2013 goes from just $450pp., with stops in Nassau as well as the Disney owned Castaway Cay. 5. 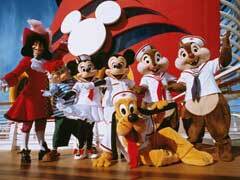 Disney cruises from Galveston, TX, travel to the Caribbean with such stops as the Cayman Islands and Cozumel. The January 26, 2013 sailing of this cruise is available for as low as $750pp. for 6 nights of Disney fun. Cheap Disney cruises mean that you can pack more vacation into a smaller budget and going with Disney you are ensured a classy, professional vacation from start to finish. With tons of thing to do on board for everyone in your party, Disney cruise deals only heighten the experience, bringing you closer to your Disney favorites at every turn. For cruising in the 2013 season, check early and often so you are assured of your spot on the sailing of your choice. Enjoy Disney cruise deals to anywhere they sail and you will have a wonderful, magical time at sea.